One of the most common personal injury lawsuits is the slip and fall lawsuit. For one thing, many different conditions can cause them. The winter months can see children and pedestrians slip and fall on icy sidewalks or paths. Careless maintenance at a supermarket can cause shoppers to slip and fall in an aisle. At the same time, slip and fall accidents are often relatively straightforward in terms of culpability: the finger can be pointed at the owner or possessor of the building or land. When the area where you slipped or tripped and fell is part of the property owner or the property possessor’s premises, and he or she failed to take appropriate precautions or correct a problem that led to the accident, the owner or possessor can usually be held legally responsible for your injuries. What follows are some examples of common conditions that lead to slip and fall accidents outdoors, and the rules regarding a property owner’s duties with respect to those conditions. The sloping surface of a parking lot causes melting ice to form puddles, and then refreeze into ice patches. In addition, if a property owner/possessor elects to provide snow or ice removal, he must not do so negligently. Inadequate lighting may also lead to accidents involving slip and falls in parking lots, trips over curbing, falls on a step or stairs from a parking lot to a store, and trips and falls due to holes, cracks, and uneven surfaces. A property owner/possessor may be liable if he or she knew or should have known of the poor lighting and failed to remedy the situation. A parking lot owner is responsible for maintaining the parking lot in a manner such that it is reasonably safe for people using it. This includes filling and patching cracks and holes. Additionally, differences in height from one section of the lot to another should be gradual rather than abrupt to prevent tripping or slip and fall injuries. Generally, a property owner is not responsible for injuries resulting from a slip and fall on a public sidewalk located outside his or her property, but owned and maintained by a city or town. However, some courts will impose liability on a business for injuries on a sidewalk used exclusively by customers coming to and from the business, and a property owner will be responsible when a dangerous condition exists on his or her own private walkways. Slip and fall accidents often lead to considerable medical bills and time away from work. In order to receive compensation for medical expenses and lost wages, injured individuals often choose to file a lawsuit against the person or company responsible for the conditions that caused the accident. A great first step in pursuing a potential claim is to contact us. The Law Offices of Jonathan C. Capp is serving Slip & Fall Accidents case clients in the following areas San Diego, CA, Escondido, CA, Carlsbad, CA, North County, CA and Coastal Area, CA. 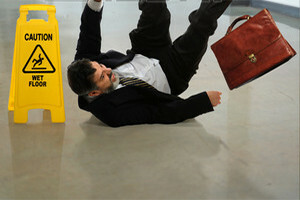 Call at (760) 231-6498 to consult with one of the best Slip & Fall Accidents lawyers in California.